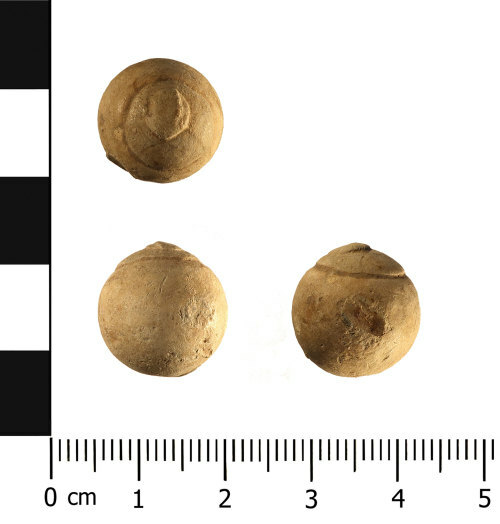 A complete lead shot dating to the Post Medieval period (c. AD 1600-1800). The object is spherical in shape with the remains of the casting sprue visible in the upper hemisphere. The object has some scratches but does not appear to have been fired. It has a greyish white patina. There are a large number of similar object recorded on the PAS database, including: PUBLIC-C52D9A; DEV-9635B4; and LEIC-E156C8. The overall dimensions are as follows: 14.08mm in diameter and 16.52g in weight.